Born on 5 March 1847 at Orton Longueville near Peterborough, Charles Gordon was the eldest son of Charles Gordon, 10th Marquess of Huntly by his second wife Maria Antoinette, daughter of Reverend Peter William Pegus. 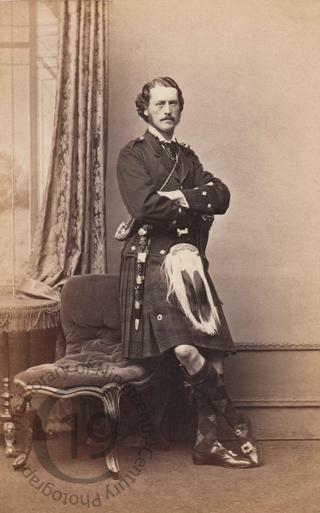 He was styled Lord Strathavon until 1853 and Earl of Aboyne between 1853 and 1863; he succeeded to the marquessate, a Scottish peerage, in 1863 at the age of sixteen. Lord Huntly was educated at Eton and at Trinity College, Cambridge. In 1870 he was appointed a Lord-in-Waiting (government whip in the House of Lords) in the first Liberal administration of William Ewart Gladstone, a post he held until 1873. He sat in the House of Lords by right of his United Kingdom barony of Meldrum. He also served briefly in 1881 as Captain of the Honourable Corps of Gentlemen-at-Arms (government chief whip in the House of Lords) in Gladstone's second administration. In 1881 he was invested as a member of the Privy Council and in 1930 he became the Father of the House of Lords. He married firstly Amy, daughter of Sir William Cunliffe Brooks, afterwards 1st Baronet, in 1869. After her death in 1920 he married secondly, in 1922, Charlotte Isabella, daughter of John H. Fallon of Paisley, Ontario, and widow of James Macdonald of Cincinnati, Ohio. Both marriages were childless. Lord Huntly died on 20 February 1937, two weeks before his 90th birthday, and was succeeded in the marquessate by his great-nephew, Douglas Gordon. Photographed by George Washington Wilson of Aberdeen.